Payment processing for these fees will be available online in the next week so stay tuned. As always we are here to help if you need us. 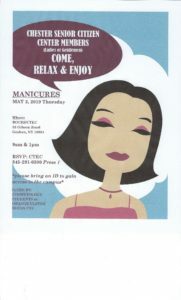 For our senior citizen residents OU BOCES CTECH Cosmetology students are offering free manicures and hand massages on Thursday, May 2nd at 9am and 1pm. If you are interested in this service please see the flyer below and make an appointment. If this is successful in the future we will be having a day for our senior citizen residents every 2 weeks for this service. So don’t delay call and make your appointment today. Work Session appearances are scheduled by request in accordance with the dates listed above. Please call the Village Office at 845-469-2388 to schedule an appearance. The Work Session is a technical discussion between the applicant and Planning Board members and consultants. The public is welcome to attend and observe Work Session proceedings. This schedule will remain in effect unless otherwise noted or revised by the Village of Chester Planning Board. Entrance to Conference room is through the police station, second floor, 45 main Street.